The 800-year reign of the Moors in Spain has left its mark in the southern region of Andalucía, more so than in others, in more ways than one. Language, architecture, music, dancing and, of course, in the cuisine. When the Moors invaded Spain and settled on the peninsula, they brought with them their own taste of home, which is still notable in the food of this region today. 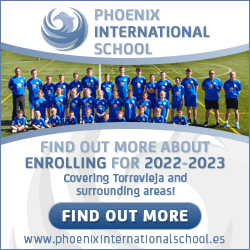 As well as presenting the natives with new methods of farming and construction, they also introduced a diverse array of crops, spices, ingredients and flavours that have had a lasting effect on the Spanish cuisine in this region for all this time. 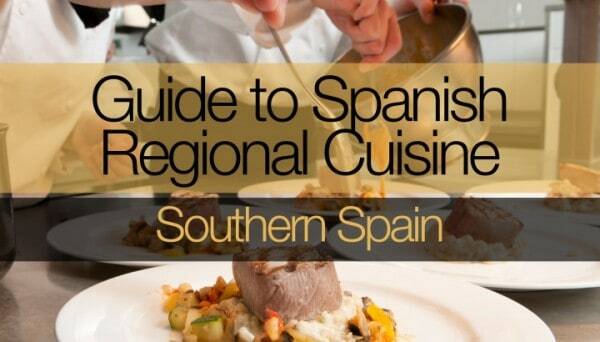 While much of Andalucía is situated on the coast, fish and seafood make up much of the staple diet of this region. The southern coast of Spain produces some of the best quality fish in the whole of Europe and much of it is kept in the region and enjoyed by residents and visitors alike. Fish is often baked, fried, deep-fried or grilled and served on its own with lemon, with salad or a light dip. Or it is made into soups and stews and served with fresh, crusty bread. Seafood is generally deep-fried, often in batter or flour, and served on a platter with just a wedge of lemon. You can’t visit Andalucía without trying their grilled sardines or deep-fried squid. The Arabs brought the orange and lemon with them – and lots of them at that. With hot summers and mild winters, the region is ideal for cultivating most fruits, and you will also find an abundance of strawberries, melon, pomegranates and figs growing there. Figs grow in the wild and Granada was named after the pomegranate, which thrives there. This region is famous for using fruit in its savoury cooking, an influence from the Moors, and you will often taste meat or fish dishes flavoured with orange, not to mention sweet spices such as cinnamon and nutmeg. 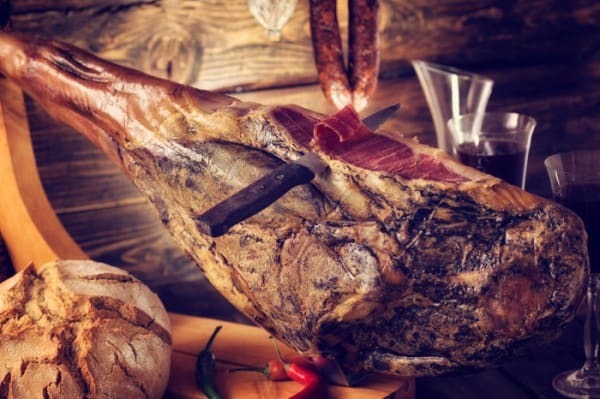 Some of the best jamón serrano (cured ham) comes from the mountainous areas of Andalucía. The Sierra de Aracena is one of least visited and remote parts of the region and this is where the little village of Jabugo is located. While small in size, Jabugo is big in reputation as it not only produces the best and tastiest jamón ibérico, but this is also where you get the equally revered pata negra cured ham. The black Iberian pigs are mainly fed on a diet of acorns and olives for most of their lives and they are also allowed to roam free in the oak groves, therefore, getting plenty of fresh air and exercise. The best treatment of these pigs, produces the best quality ham. 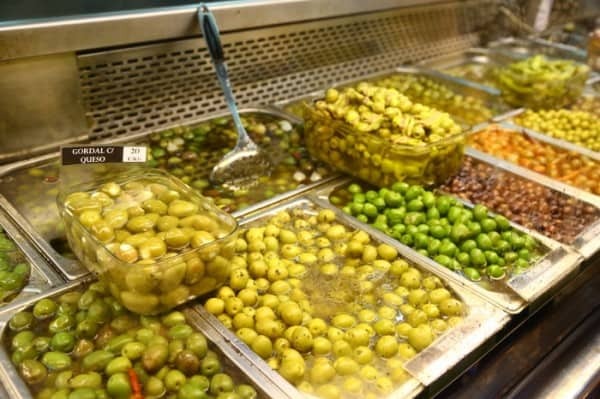 Olives come in all shapes and sizes in Andalucía and are present at every meal in some shape or form. Olive oil is used in most dishes and extra virgin olive oil is drizzled over the morning ‘tostada’ at the first meal of the day. Olives are stuffed, marinated or eaten as they are, often served as an accompaniment to a glass of cold beer on a hot summer’s day, or all year round, come to think of it. Olive oil and sherry vinegar, also produced in the region, are drizzled over salads that is usually served at lunch and dinner before the main meat or fish dish. Andalucía is the world’s largest producer of olive oil and a third of all the olive oil in Europe comes from this region. Andalucía really is the land of the olive. One cannot discuss the food of southern Spain without mentioning the tapa. The tradition of serving small portions of fish, meat or salad dishes on a small plate to go with a cold drink is now popular all across the country and is what Spain is known for in culinary terms. However, the humble tapa originated here in Andalucía. It is still tradition in the majority of establishments, especially in Granada, for bar owners to offer a free tapa with every drink purchased, and you can easily bar-hop your way around a town enjoying delicious tapas and drinks along the way. This is probably the most well-known dish to originate in the south of Spain and is served across the country, mainly in hot weather. 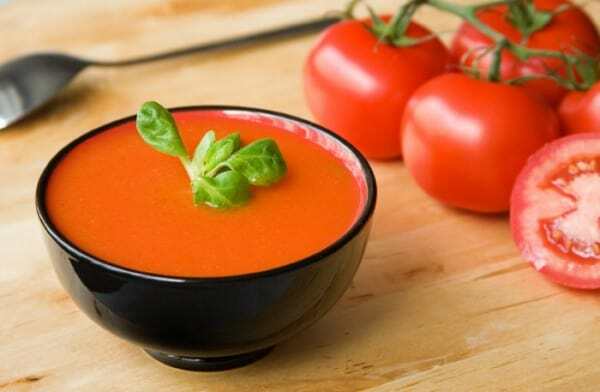 Gazpacho is a delicious, chilled, raw soup, served as a starter, made from tomatoes, cucumber, peppers, olive oil and vinegar. It is often garnished with croutons, diced cucumber, onions or red peppers on top. This is also another popular dish that is predominantly served in coastal regions where fish and seafood are aplenty. It basically consists of various white fish and seafood, such as prawns and squid, which are deep-fried in batter or flour and served on a platter with a lemon wedge and garlic mayonnaise as a dip. It is generally served as a starter and goes well with wine or beer. It is very traditional in Málaga, Cádiz, Almería and even inland in Córdoba and Sevilla. This dish basically consists of broad beans and jamón serrano. The dish has extended all over the country and is typically referred to as “Spanish-style” beans, yet habas a la rodeña originated in the town of Ronda. The dish is served warm and also contains tomatoes, onions, red peppers and hard-boiled egg. The rabo del toro is the tail of the bull, and this dish is better known as braised oxtail stew. 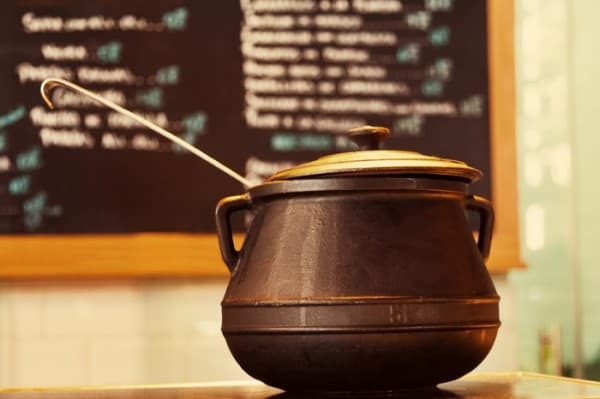 It is actually one of the most delicious and popular dishes to originate from Andalucía, and more concretely, from Córdoba, and is one of the most typical dishes of Spain, funnily enough. 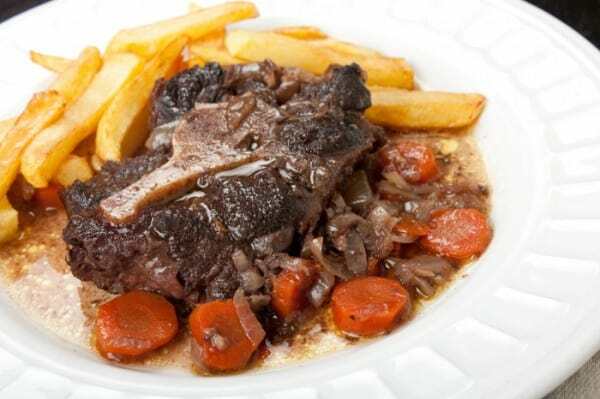 The ox or bull’s tail is cooked slowly over a low heat with vegetables and red wine or sherry. Tradition says that after a bullfight, the tail of the bull that had just been killed would be used for this dish, although this does not happen nowadays. This is a typical Spanish dish that involves baking a whole fish, such as sea bass or sea bream, whilst it is covered in a thick coat of salt. If done properly, the result is a beautifully cooked and moist fish that looks wonderful as it is being presented on a plate to the diner. It is usually served with garlic mayonnaise or a mild parsley sauce. This is a great dish for pasta lovers. It originated in Málaga and is basically the same as a paella, but instead of using rice, you use their local spaghetti. The rest is the same as for a seafood paella – shellfish, prawns, clams, crab, peppers, saffron etc. This is a typical fish soup flavoured with oranges from the Cádiz region that are usually exported to the UK to make marmalade. The broth of the soup has a bitter orange flavour and it also contains bread, potatoes and clams. 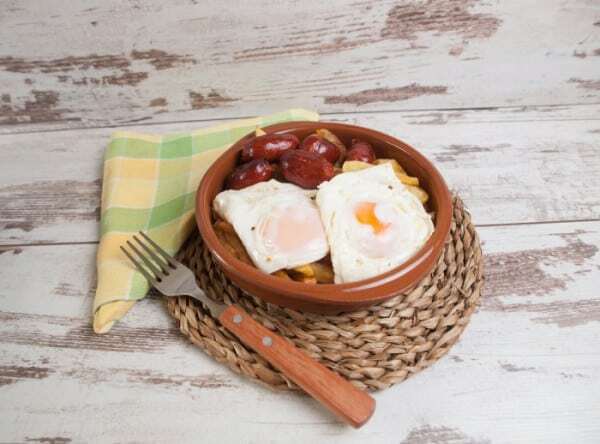 Eggs are used a lot in Andalucían cooking and this dish is often seen served in many of the restaurants in Seville. It basically consists of eggs that are divided into individual clay ramekins and baked in the oven with vegetables, jamón serrano and chorizo. This is a popular dessert from the region, especially Jérez de la Frontera, that literally translates to “bacon from heaven”. We would know it as crème caramel or flan. It is made from caramelised egg yolks, sugar and water. 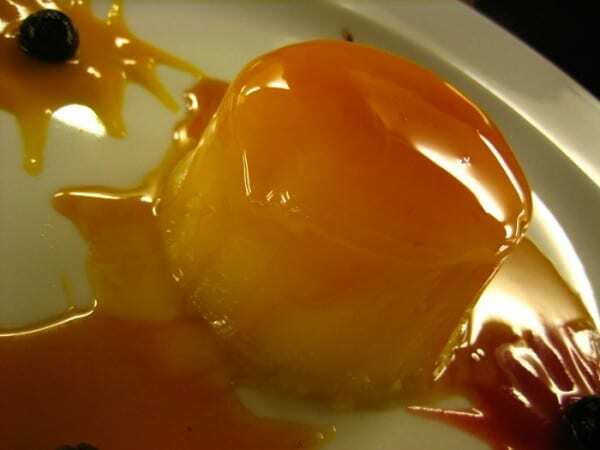 The recipe dates back to around 1325 and is said to have been created by the nuns in Jérez with the egg yolks that were given to the convents from the eggs that were leftover by the wine producers of the area.